Swiss multinational Nestle has announced the launch of a new KitKat variety coated with cocoa processor Barry Callebaut’s “ruby” chocolate. The new variety, called Sublime Ruby, will go on sale as part of the KitKat Chocolatory series, which is available in Japan in boutique stores of the same name. In a statement, Nestle said that “the launch of breakthrough innovation like KitKat Chocolatory Sublime Ruby underlines Nestlé’s commitment to growing its leading international confectionery brands around the world”. Barry Callebaut first unveiled its “ruby” chocolate in September 2017, announcing it as new form of chocolate to sit alongside existing milk, dark and white chocolate options. According to the firm, ruby chocolate has a “fresh berry-fruity taste and characteristic color”. Made from the Ruby cocoa bean and pinkish in colour, it is said to be free from berries, berry flavor and added colouring agents. Commenting on the launch, Barry Callebaut CEO Antoine de Saint-Affrique said: “I am very pleased that our innovative breakthrough Ruby chocolate has come to life so quickly through our partnership with Nestle and the pioneering KITKAT® Brand in Japan. 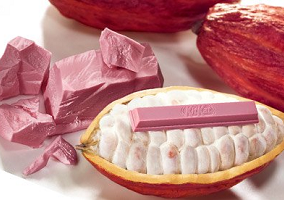 Nestle was very quick in spotting the trend and in introducing a Ruby chocolate version of KITKAT®, which will entice consumers across Asia and beyond”.